Day 1: An awe-inspiring Elephant Experience. Collection from your hotel or airport and journey to Elephant Hills in Khao Sok National Park. Immerse yourself in our award-winning Elephant Experience. 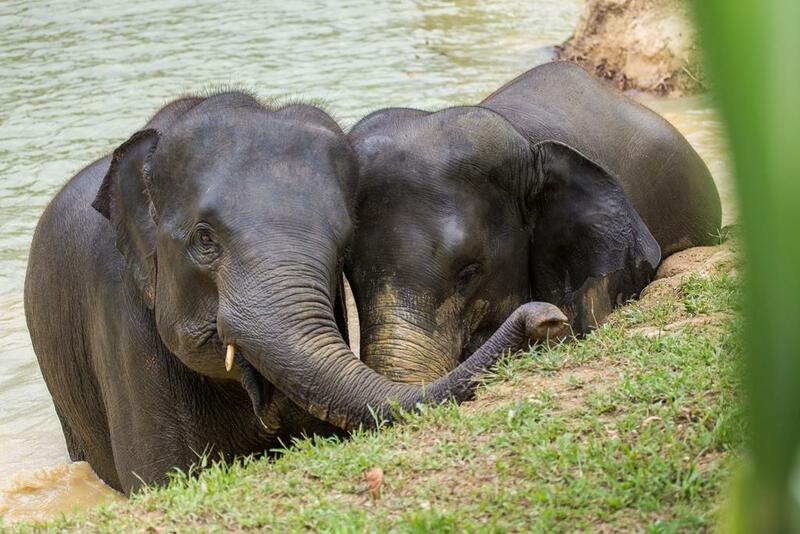 Feed and interact with Asian elephants in their natural environment. A day you’ll never forget in an unspoiled oasis. Explore the Sok River by guided canoe safari. Sit back, relax, and enjoy. An authentic Thai dinner and choice of movie presentation, cooking demonstration or dance performance. Day 2: The beautiful Cheow Larn Lake. A trip to rural Takhun’s local market to get a taste of true Thai culture. Glide along Cheow Larn Lake on a traditional longtail boat. Enjoy lunch and optional canoeing at award-winning, Rainforest Camp. Intrepid afternoon trekking through the Khao Sok rainforest. Wind down with dinner and evening activities at the overwater Rainforest Camp. Day 3: Nature at its finest. Opportunity to see more wildlife on a guided canoe safari. Swimming and lunch at Rainforest Camp. Goodbyes to new friends before your onward transfer. Please note: All of our activities are weather dependent and rely on local conditions. As such, they may be subject to change. Settle in for the trip of a lifetime. One of our friendly drivers will collect you from your hotel or airport in Phuket, Krabi, Khao Lak, Surat Thani, Phang Nga or Koh Samui, before whisking you away to Khao Sok National Park. Marvel at the beauty that Southern Thailand has to offer as you travel across the countryside to Elephant Hills. You’ll be welcomed to The Elephant Camp by your guides, where buffet lunch awaits you. Sample a variety of authentic Thai food, cooked freshly on site by our wonderful team of cooks. Take note of any favourite dishes as you’ll have the opportunity to learn some culinary secrets later this evening. Find your bearings around camp and explore your luxury canvas tent before getting ready for adventure. Travel through time by canoe. Ready to see more of the stunning rainforest? There’s no better way than by boat. Take a seat in one of our canoes and look for tropical wildlife while a local river guide paddles you down the Sok River. You’ll be venturing into areas of primary rainforest, some of which has changed very little over thousands of years and is thought to be the oldest in existence. 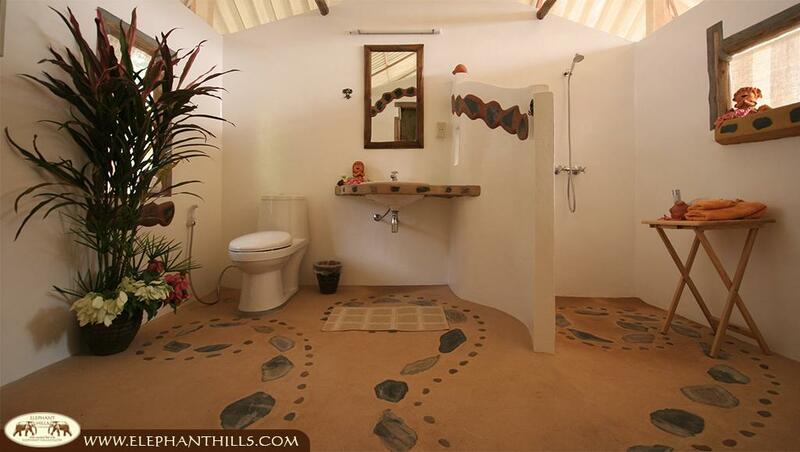 An Elephant Experience like no other. From your canoe on the river, you’ll head to the chain-free elephant park where you’ll learn more about Thai elephants and our Elephant Conservation Project, before heading into the park to meet the pachyderms up close. Here, you’ll not only get to see one of these gentle giants but have the opportunity to touch and feed them in a respectful, ethical setting. The elephants here live in a natural environment and are not forced to entertain or perform. Instead, you’ll prepare and feed them their lunch, then observe them playing with each other and splashing in their elephant pool. This once-in-a-lifetime experience is sure to leave you spellbound. After an action-packed day of exciting activities, retire to your luxurious safari tent at Elephant Camp for a well-earned hot shower. Optional entertainment this evening includes a dance performance by children at the local school, a movie screening, or a chance to improve your kitchen skills with a Thai cooking demonstration. Alternatively, put your feet up and relax on your private porch, soaking in the vista of the tropical rainforest and mountainous jungle. The Jungle Explorer’s Club Bar will be open for business this evening, so if you want to add a cocktail into the mix, you’ll be in good hands. At 8:00 pm you’ll enjoy dinner, set in the idyllic jungle-side location of the camp. The atmosphere is incomparable to anything you have experienced before. With that fantastic end to your evening, you’ll be ready to retire to your safari tent, where a deep, linen-bedecked bed awaits you. Your room comes with all of the comforts you’d expect from a hotel, including hot water, a private en-suite with a Western toilet, reading lights, and tea/coffee making facilities. 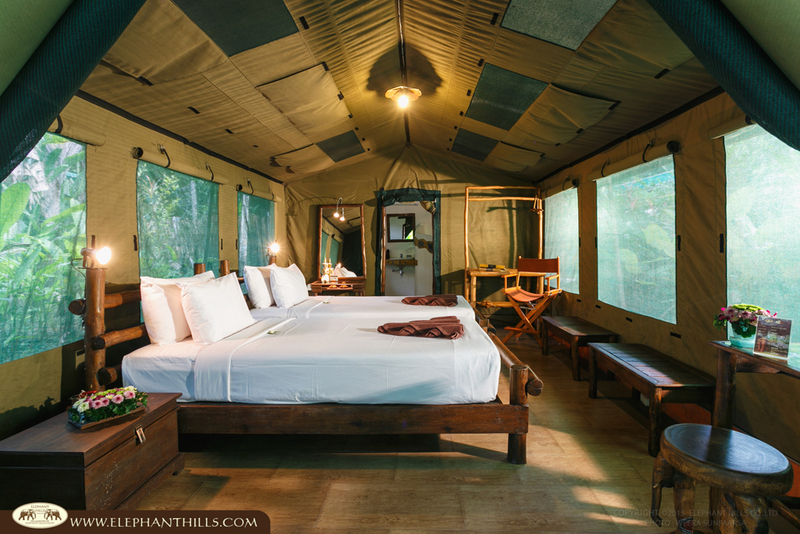 All tent openings are equipped with mosquito nettings in addition to canvas flaps, so you can rest easy knowing you won’t have any insects joining you overnight; snuggled under layers of warm blankets, you can truly experience the best of wild tropical rainforest and luxury accommodation, combined. Forget the intrusive alarm clock, this morning you’ll be gently woken by birdsong and the sounds of the rainforest awakening. Pour yourself a tea or coffee to enjoy on your verandah before having breakfast at your leisure. 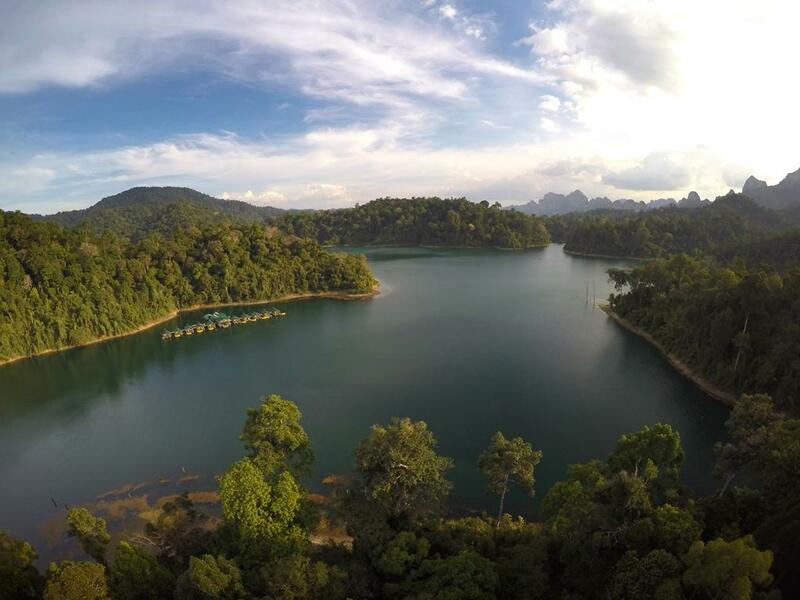 Cheow Larn Lake: the adventure awaits. Today you will venture out by long-tail boat to explore everything that Cheow Larn Lake has to offer. Traverse the turquoise waters and marvel at the towering, rainforest-covered mountains that line its shores. This lake is the life source for much of the native wildlife, so keep a close eye out in case of a chance spotting of an Asian ox, wild elephant or clouded leopard. If you cast your gaze into the canopy above, you’ll be treated to a bird-watchers paradise; with a huge array of tropicals birds and monkeys that call this area home, you will marvel as the treetops come alive before your very eyes. Paradise just got even better. After your morning spent gliding across emerald waters, it’s time to head to Rainforest Camp, Elephant Hills’ incredible floating village of luxury tented accommodation. With all of the creature comforts you experienced in Elephant Camp, Rainforest Camp also boasts panoramic views, private kayaks, and a lakeside verandah from which you can watch the world pass by. Here you’ll have a delicious buffet lunch of Thai dishes prepared fresh and in-house, before setting off for the next adventure. After refuelling, it’s time to explore the jungle on foot, experiencing a part of our world practically untouched by time. While the trek isn’t strenuous, it can be steep and slippery at times, so please speak to your guide if you are feeling at all concerned. However, we can’t stress enough that this walk isn’t a test of stamina or endurance, instead, it’s a unique opportunity to observe the native ecology in one of our planet’s oldest areas of rainforest. From giant hardwood trees to exotic orchids, palms, ferns and bamboo; to the thousands of species of wildlife that live here; a slow walk of discovery through the rainforest gives you a true insight into the natural world. As the sun starts to lower over the ancient limestone cliffs surrounding you, collapse into a deckchair on your lakeside patio to enjoy the sunset, or freshen up with one last swim, straight off your deck, before you prepare for dinner and bed. Another delicious, freshly made Thai meal of authentic local produce awaits you this evening, so enjoy the feast before retiring under the canopy of stars – photos don’t do it justice. Day 3: Nature at its finest. An untouched paradise. With your time at Elephant Hills coming to an end, today is your final day to create memories of this tropical paradise to take away with you. Start your day listening to the gibbons as they call to each other in the forest canopy, then sit on your lakeside balcony with a warming tea or coffee as you watch the sunrise, clearing the settled mist from the water. What will the day bring? How about a refreshing dip in the lake? Or exploring the lake by kayak with your loved one? Perhaps you simply want to sit and soak it all in one last time. Whatever you choose, enjoy every second. 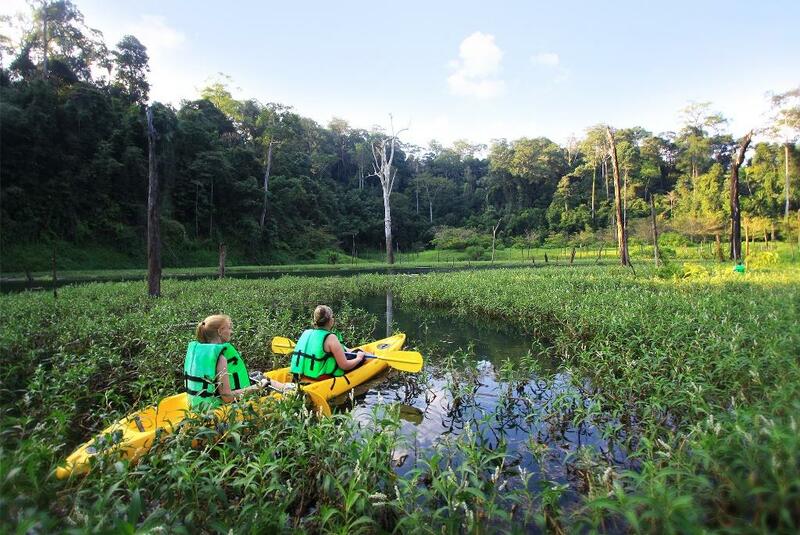 After fuelling your body and soul for the day, join your guide on a canoe safari into the hidden channels of Cheow Larn Lake. Keep your eyes open as you may spot an exotic hornbill bird in the treetops, or even a leopard stalking through the trees. 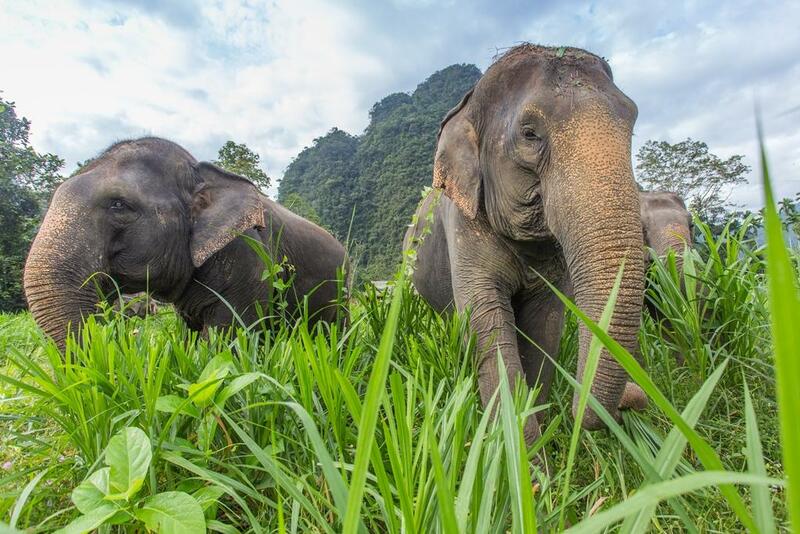 We can’t guarantee what animals will make an appearance on the day, but there’s certainly no shortage of wildlife in Khao Sok National Park. With the end of your tour fast approaching, there is time for one last meal with the group, served at your home-from-home, the floating Rainforest Camp. Share food, photos, stories, laughter and contact details with your fellow travellers, before returning to the pier to be transported to your next destination. Your holiday with Elephant Hills may be over, but the memories of your magical time spent at the Rainforest Camp will last a lifetime. Elephant Hills tours are not recommended for children under the age of 7. Elephant Hills does not accept responsibility for children under the age of 7, pregnant women, people of ill health or anyone who is suffering from any congenital disease, sickness or injury unknown to Elephant Hills prior to arrival. Children’s ages: 7 -15, for children under the age of 7 parental discretion is required if you wish to bring them on our tours. Elephant Hills does not accept responsibility for children under the age of 7, pregnant women, people of ill health or anyone who is suffering from any congenital disease, sickness or injury unknown to Elephant Hills prior to arrival. All Elephant Hills Rainforest Camp, tour packages are fully inclusive of accommodation, full board, activities as per chosen itinerary, a fully trained, TAT-licensed English speaking Thai tour guide as well as joint transfers to and from Elephant Hills as per our transfer options. Kids between 7-15 years profit from our sensational kids’ discounts. Please understand that we cannot welcome children younger than 7 years of age.